Customer Experience Archives - Page 6 of 6 - Go Creative Go! Yes, I have a thing for Scottish bands. It started with me seeing Idlewild perform “You Held The World In Your Arms” on the Jimmy Kimmel show back in the early 2000’s. Well, it probably started WAAAAAAAAY back when I was about eight and my uncle turned me into a bit of a music nut at an early age, but we’re talking about the Scottish band thing, not my music nerd status, right? Once I find a great new band, I then seek out all of the bands that “sound like” them. Several years later I stumbled across a band called Frightened Rabbit and I was hooked. They have been my favorite band for several years and prompted a serious seeking out of similar sounds. A conductor as in an orchestra or as in electricity? Sometimes I like to pepper my articles with definitions from a very sound resource, dictionary.com. This article is one of them. a person who conducts; a leader, guide, director, or manager. a substance, body, or device that readily conducts heat, electricity, sound, etc. What do either type of conducting have to do with better blogging? I’m so glad you asked! As a blogger you aren’t just writing for the sake of publishing. You’re hoping for a conversion of some sort or another. You’re blogging and sharing your articles hoping to draw your readers into an action: signing up for your list, sharing your article, commenting, even – eventually, buying your product or service. In order to craft and create that conversion you have to conduct your readers, leading them – hopefully, to take the action you intend. You can’t just holler out to take action in the loudest voice possible. Well, you can, but that’s pretty heavy handed and often has the opposite result. First, you conduct your audience to action subtly, with nuance and nimbly adept writing. Much like the orchestra conductor directs the subtle nuances and nimble notes of the piece being performed. Secondly, you can electrify your audience with your excitement and passion for the project. Each approach works differently, but both can be quite effective. How do you choose the proper conductive approach when it comes to your blogging? You have to know and understand your audience. You also have to know and understand your offering, be it an offering for sale or an offering to take action. Much like the orchestra conductor knows how much he can get from each violinist, from each flautist, you must know what you can get from your audience and how to get it. Then you must conduct yourself, through your blogging, accordingly. How do you conduct your blogging audience? Are you more likely to employ electricity and excitement, or more subtle nuance? Content Marketing: Can Storytelling Sabotage You? We’re asked daily if we’re telling our story. Our brand story, product story, personal story, bathroom break policy story. Okay, I may have taken it a step too far with the final example, which leads me to the point and purpose of this article. Can we take storytelling too far? Can storytelling go wrong? Can we sabotage our story and, with it, our brand or business? Yes! If you get a little too caught up in telling your story, the focus becomes all about Y-O-U. While the story should always reflect you, it should also draw in your audience with the allure of either a shared experience or a solution that fits their needs, suits their situation. The story has to relate to your readers in a significant way or they’ll pass it off as needless and narcissistic. The story starts to sabotage you when you forget you’re writing for the audience and start lauding yourself as the storyteller. If your story resonates with your readers, taps into their emotions, causes them to reconsider or persuades them to pose a question … well, then it’s successful. If your story causes your audience to take any action except clicking away to something more suitable, I say you add a check to the win column. However, far too many stories cause that calculated “click away.” Once a reader clicks away too many times they might consider opting out, hiding you from their streams or even, YIKES, unfollowing you. Is Your Story Too Long? A connection of mine recently spun out a personal story over several blog posts, social media posts and more. The story was quite compelling. Something very relatable to a large part of the overall population and her following. The problem? It centered solely on her experience. Which would have been absolutely fabulously okay for one reading, one share. But the story went on and on, with the same chapter and verse repeated over AND over again. Instead of spinning the story in a different direction and drawing in readers by making it about THEM, she centered the story on herself. The Story Killer? Self Congratulations! This connection made a fatal error when the story stopped being about the story itself, a shared experience that could have touched many, and continued to share her own successes, tied to the story, in a self congratulatory way. Put quite simply, the repeated postings started to sound an awful lot like bragging. If your story screams, “See ME, see how I prevailed,” it’s no longer a shared story that’s meant to spark discussion, create connection and build lasting relationships. Consider this, is it a story or a press release? Are you broadcasting or sharing? Is it all about you, or is it about your audience and their experiences? Stories can absolutely sell. But they first have to connect with your audience, building trust in your shared experiences. Otherwise it’s just a promotional blast that will fade into the noisy and forgettable content coffers. How do you share stories without making them all about Y-O-U? Mallie Hart http://www.gocreativego.com/wp-content/uploads/2016/07/GCG-sitelogo-new.png Mallie Hart2014-11-18 08:40:272014-11-18 08:40:27Content Marketing: Can Storytelling Sabotage You? 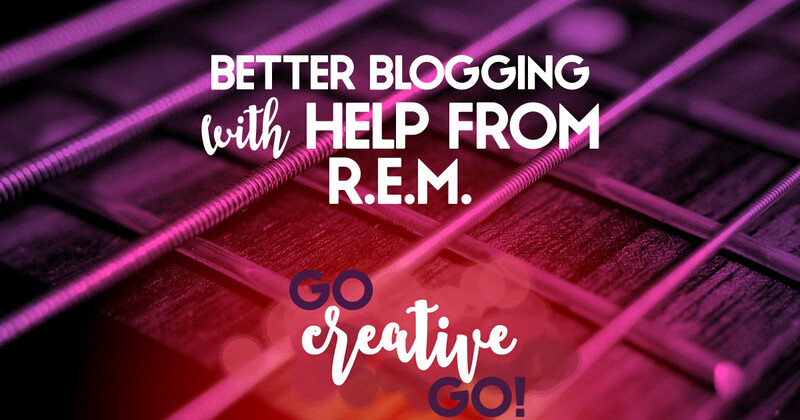 Better Blogging: With A Little Help From R.E.M. A couple weeks ago I published an article with some blogging best practices that I culled from some of my favorite Depeche Mode tunes. It was an entertaining publish and it allowed me to share a little bit of Mallie that isn’t on display every day. I thought I’d give it another whirl, this time with the tunes of another favorite band, the ever awesome R.E.M. Better Blogging While Listening To R.E.M. It isn’t always easy to give away your knowledge and expertise. We feel, and often rightly so, that we should be paid for that expertise and know how. It requires careful balance and writing skill to write a blog post that shares enough knowledge to showcase our value and smarts, but doesn’t give away our “state secrets,” so to speak. The best blogging creates the trust in our experience and expertise that leads our readers into our sales funnel. So, we do have to give a bit away. With intent and purpose, of course. If we’re blogging for business purposes, our end goal is a sale, a client. Our blogging efforts are part of the perfect circle that builds trust, shares our expertise, answers the questions of our prospective clients and eventually draws them into our sales funnel. It can’t be all about the sale. The perfect circle idea requires that the expertise be shared, then the trust built, before any social selling can be even remotely effective. We’ve long known that entertaining while educating can make a good blog post great. Sometimes we can share valuable insight with our audience by allowing them laugh with us, by sharing anecdotes and lessons learned from our own failures. Part of building a successful blogging presence involves creating a sense of belonging for your audience. Your readers want to feel welcome, invited and part of your articles. The best blogs and bloggers invite their audience to share an experience. to belong to the discussion, to share in the exchange of ideas. When your readers feel like they belong, that they’re welcome, your blog flourishes. Now, you might think the title of this song would lead me to write about using your blogging efforts to take a stand. While I wholeheartedly agree with that idea, that’s not why I chose this song. Amidst the many very emotional and often melancholy offerings in the R.E.M. discography, this song is one of their silliest. Silly and fun. It’s absolutely okay to employ the occasional bit of silly in your blogging. 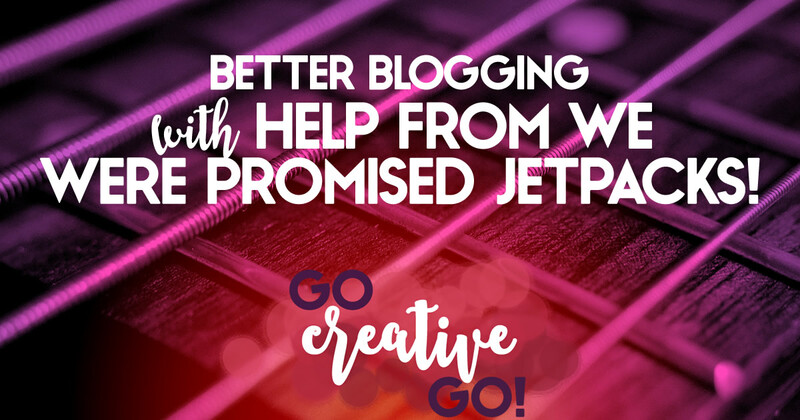 It’s okay to have fun, show your silly side and, maybe, I don’t know … write an article about songs helping better blogging efforts! It’s silly to pretend that our blogging efforts aren’t designed to persuade our readers to buy. We’re blogging for business, right? Our business doesn’t succeed if we don’t sell the products and services we provide. However, we also know that our articles have to build trust. Our audience is smart and savvy, and they’ll see right through petty and pretty persuasions. We are not in the business of blogging to confuse, confound or put one over on our audience. Lose the pretty persuasions and you’ll build an audience that trusts your expertise and experience. Keep the pretty persuasion and confusion tactics and you’ll come across as a snake oil seller. I’ve actually saved my favorite R.E.M. song, King of Birds, for a solo article. I hope you enjoyed this walk through the band’s discography. Do you agree with any of the ideas shared? http://www.gocreativego.com/wp-content/uploads/2014/10/GCG-pinnable-REM.jpg 1080 735 Mallie Hart http://www.gocreativego.com/wp-content/uploads/2016/07/GCG-sitelogo-new.png Mallie Hart2014-10-13 10:59:552016-10-07 20:50:20Better Blogging: With A Little Help From R.E.M.